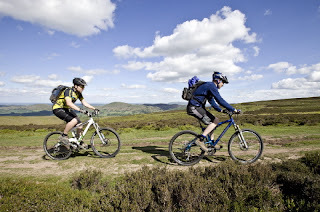 adventure for everyone: gr8trails supports Plush Hill Cycles, Church Stretton. Plush Hill Cycles celebrated its first full year of trading earlier this summer. The gr8trails team joins up to give its support and promote mountain biking in Church Stretton and across the UK. ‘Plush’ is a combination of enthusiasm and mountain biking experience from around the world. A shop that is dedicated to all that is biking. Big on service, Al & Kate ask you to visit, chill out, have a brew, whilst watching the Tour on the big TV or flick through some bike mags, whilst sharing stories of trails ridden. Now in its second year, Al & Kate offer a wide choice of well known brands; commencal, genesis, norco, yeti, ridgeback, Saracen, ragley, ghost, sram, blackburn, giro, fox, shimano, avid, troy lee designs, park tool, Madison & continental to name a few. As well as fixing and upgrading your bike, they offer a bike demo and hire service too. In partnership with plushhillcycles, gr8trails can offer guided mountain biking around the Church Stretton and Long Mynd area. As well as guided mountain biking and walking in North Wales and around the UK. gr8trails founders, Rick and Adrian are passionate about the outdoors, with over 10 years of successful group guiding in the UK. Wishing to bring ‘adventure to everyone’, no matter what your age, experience or ability. Your gr8trails experience includes food and accommodation, transport during your short break, fully organized and guided activities, all tailor made to your own requirements. Whatever your inspiration, your ability or experience, contact gr8trails to tailor make your perfect break. Plushhillcycles is based in Church Stretton, 1 hours drive from Birmingham, 1hr45mins from Nottingham & under 3 hours from London. Church Stretton is also on the main Manchester to Cardiff line, within 2hrs of Manchester and 3hrs of London. On behalf of gr8trails and plushhillcycles we look forward to welcoming you to the stunning Long Mynd area.